An Australian Greens activist has been "designated" by the US Treasury Dept as a key agent of the narco-terrorist Revolutionary Armed Forces of Colombia (FARC). 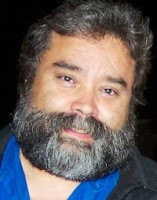 He is Vlaudin Rodrigo Vega (aka "Carlos Vlaudin") who stood for the Australian Greens in the Fowler electorate in the 2007 Federal Elections. "Washington, DC--The U.S. Department of the Treasury's Office of Foreign Assets Control (OFAC) today designated three international representatives of the Revolutionary Armed Forces of Colombia (FARC), a narco-terrorist organization. The OFAC action was taken pursuant to the Foreign Narcotics Kingpin Designation Act (Kingpin Act), which applies financial sanctions against significant foreign narcotics traffickers and organizations, like the FARC. "Today's action exposes three additional members of the FARC's International Commission," said Adam J. Szubin, Director of OFAC. "The FARC is one of the world's largest suppliers of cocaine and continues to be Colombia's most notorious and vicious narco-terrorist organization. This is the seventh action over the past year that OFAC has taken against this group and we will continue our efforts to financially isolate the FARC, its leaders and their support network." The three individuals designated are identified as key members of the FARC's International Commission: Omar Arturo Zabala Padilla (alias "Lucas Gualdron"), Maria Remedios Garcia Albert (alias "Soraya" and "Irene"), and Vlaudin Rodrigo Vega (alias "Carlos Vlaudin"). These International Commission members represent the FARC in France, Italy, Switzerland, Spain, and Australia. As representatives of the FARC and members of its International Commission, these individuals work abroad to obtain recruits, support, and protection for the FARC's acts of narcotics trafficking and terrorism. Omar Arturo Zabala Padilla, the FARC's International Commission member for France, Italy and Switzerland, directs nearly 80% of the FARC's activities in Europe, which include contacts with other terrorist groups and arms deals. Maria Remedios Garcia Albert, the FARC's International Commission member for Spain, a key liaison between the leadership of the FARC and its supporters based in Europe, was arrested by Spanish authorities on July 26, 2008 and later released pending trial. Files recovered from the computer of Raul Reyes, a top FARC leader who was killed by Colombian forces in a March 2008 raid, noted the "special support" of Vlaudin Rodrigo Vega, the FARC's International Commission member for Australia." Mr Vega has admitted being a FARC supporter. Colombian intelligence was working through Interpol to confirm the identity and activity of an Australian supporter referred to by the nickname "Carlos Vlaudin" in computers captured from FARC, according to a weekend report in the Colombian newspaper El Tiempo. In June, a Chilean-born candidate for the Australian Greens, Vlaudin Vega, told The Australian he was a FARC supporter. Mr Vega said if his unusual first name were mentioned in the "alleged document" on a FARC computer, it would be him. In March, Colombian forces killed the No2 FARC leader Raul Reyes and seized his computers. Reyes was responsible for FARC's International Commission, which ran propaganda campaigns and raised money. FARC is listed as a terrorist organisation in Europe and the US, but not in Australia. In 2002 Mr Vega was coordinator of the Colombian Solidarity Committee (CSC) in Sydney. More recently he has been active in the Australian Bolivarian Circles, a support group for Hugo Chavez's socialist Venezuelan government. Supporters of the Venezuelan and Cuban revolutions assembled on April 11 at the Iberoamerican square to commemorate the failure of the April 2002 US-backed coup against the government of Venezuela’s socialist president, Hugo Chavez. In April 2007 Mr Vega organised a Sydney event, attended by Venezuelan Charges D'Affaires Nelson Davila and Cuban consul general Nelida Hernandez Carmona to mark the failed 2002 coup attempt against Hugo Chavez. The event was also sponsored by members of Australia's largest Marxist-Leninist organisation Democratic Socialist perspective, including leading member Lisa Macdonald. Cuban consul general Nelida Hernandez Carmona, Buena Ventura Reyes Acosta, Nelson Davila and Alicia Corredera. Venezuelan charge d’affaires Nelson Davila, standing in front of a statue of Simon Bolivar, the Venezuelan-born South American independence hero who led a war of liberation against Spanish colonialism in the 19th century, spoke of the need for continued solidarity with Venezuela. Vlaudin Vega of the Bolivarian Circle, organisers of the event, explained that the revolution was strongly rooted in the mass organisation of the people and thus able to defeat the coup attempt. Lisa Macdonald from the Australia-Venezuela Solidarity Network emphasised the importance of getting the word out to Australians about Venezuela’s Bolivarian revolution, led by Chavez’s government. 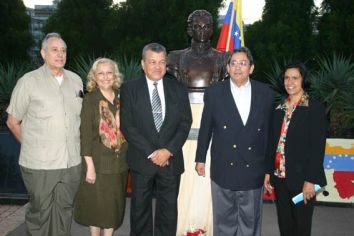 At the statue of Jose Marti, the vice-president of Cuba’s Institute of Friendship with the People, Buena Ventura Reyes Acosta, stressed that solidarity bonded those who support Cuba and Venezuela. In August 2001 Mr Vlaudin was the leader of 16 protestors who took over the Colombian consulate in Sydney. Although the matter was resolved peacefully the consulate at one point was surrounded by heavily armed tactical response police. Thanks for reporting on this Trevor. I wouldn't have known otherwise because the only media outlet that seems to have covered it is Voice of America. I thought this would be a big story that deserved a bit of scrutiny. I would have thought so too Cameron. Those bloody lefties controlling the MSM eh? Why the hell this guy is not in jail??????? they are not only promoting, but supporting a terrorist organization very active in killing inocents citizens in venezuela and colombia. And they are more than capable of ataccking australia just to fight the "empire".